Good day everyone! Since I had some extra garbanzo bean flour in my cupboard, I decided to figure out how to use it. I found a delightful recipe for chocolate chip muffins that used that type of flour, and I decided to change it a bit so that I would make cinnamon raisin muffins. The result was a beautiful, golden-brown muffin that tastes great…and is free of gluten and refined sugar too! Preheat oven to 375 degrees and line a 12 cup muffin pan with muffin liners. Set aside. Combine dry ingredients in a small bowl and set aside. Whisk wet ingredients together in a large bowl. Add dry ingredients to wet and mix until incorporated. Fold in raisins. 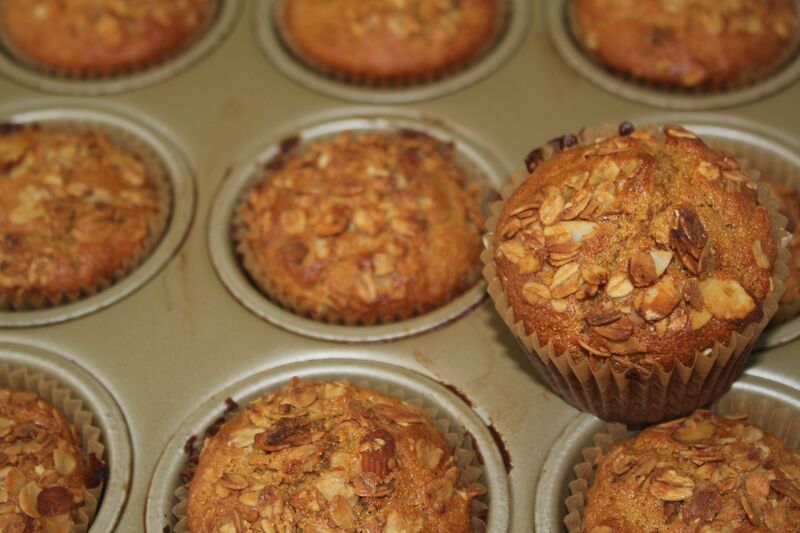 Divide muffin batter into prepared muffin cups and sprinkle the tops of the muffins with granola, if desired. Bake in preheated oven for 20-22 minutes, or until toothpick inserted comes out clean. PS: For my friends who receive my blog posts via email, I apologize for the previous email. My keyboard commands recently changed and I posted a blog rather than making a word have a bold font. Whoops! I am sharing my recipe at Simply Sugar and Gluten Free, Cybele Pascal Allergy-Friendly Cook, and Food Trip Friday. This entry was posted in Recipes - Breakfast and tagged breakfast, Cane sugar free, Dairy free, Gluten free, Muffins, raisins, Yeast free. Bookmark the permalink.